(SPOT.ph) Christmas is less than three months away, and most of us are obviously going to have to do some holiday shopping soon. Here's the good news: If you're a frequent visitor at SM Supermalls, consider your shopping expenses covered. In line with SM Supermalls' 30th anniversary this year, the country’s biggest mall network is giving three loyal customers a chance to win P5,000 worth of shopping sprees every week just by voting at the SM Most Popular Brand Poll. 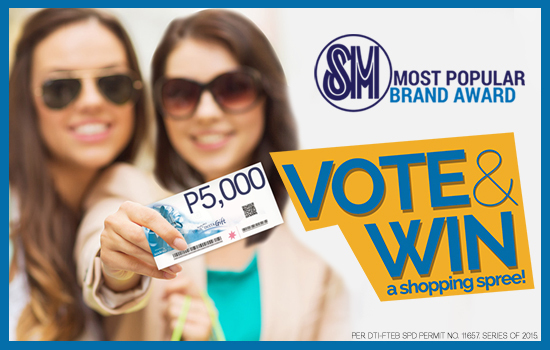 Shoppers can register and vote at www.smsupermalls.com/smvoteandwin to vote for their favorite establishments at SM Supermalls covering five different categories such as Dining, Fashion, Beauty & Wellness, Technology, and Specialty. The winners will be notified via registered mail, e-mail, call, and SMS message using the registration information you've provided. The list of winners will also be announced in the SM Supermalls website, Facebook, Instagram, and Twitter. Hurry and vote now as voting ends on October 12! To know more about the SM Most Popular Brand Award, click here.